Yes, another post on kale I am afraid before we move on to flowers again. I won’t bang on about how great kale is – I did that yesterday – but I thought I would mention this one because it has proved a good doer and is even more versatile than the ‘Cavolo Nero’ that hogged the limelight yesterday. ‘Bolshoi’ is available from Mr Fothergill’s seeds and is recommended as a baby-leaf crop. 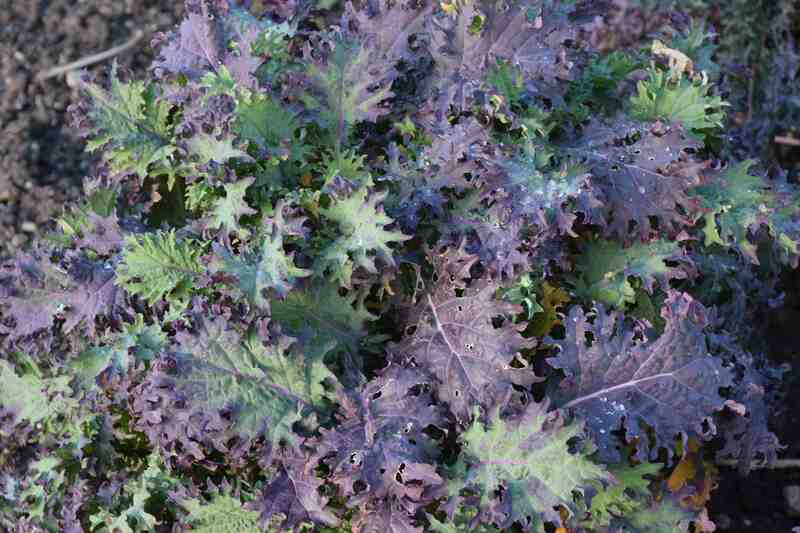 I can only assume (by the name and the look of the thing) that it is bred from or related to ‘Red Russian’ kale which is a good enough kale anyway.’Bolshoi’ has frilly leaves though not as ‘ornamental’ as the curly kales and the descriptions of it always state it has red veins in the frilly leaves. The leaves of seedlings are tender enough to eat as salads and all through summer and autumn the youngish leaves are a tasty greens. It has a very uniform and compact habit and just now, with the older leaves a rich violet and the younger leaves and shoots green with a purplish cast it is very pretty. And of course, as the new shoots start to expand as the plants try to flower, there will be a tasty crop before the plants are pulled up. Kales for summer, autumn, winter and spring crops such as this can be sown from March to July but if used as salad leaves they can be sown almost all year round. These plants (the photo shows just one plant) were sown in March. A good looking addition to the veg plot – and good for you, too! I find Cavolo “Nero” quite easy to grow ( if you can win the battle with the caterpillars!) – is this one similar? If so, I’ll look out for this one this year. Yes the caterpillars liked the Cavolo Nero! This one is similar but the leaves are thinner and not corrugated. It has a much bushier habit and all the plants have branched.